Unless someone has experience with graphic design programs, it is unrealistic to know the differences between the various types of graphic image file formats. Some formats are specifically for web graphics and others are meant for print applications. When an incorrect file format is used for an illustration or photograph, the visual difference is immediately apparent. With barcode symbols, which are meant to be read by a scanner and not a human eye, using an incorrect file format for a barcode image creates similar problems, but ones that may only be detected by barcode testing equipment. Unfortunately, these issues are frequently discovered AFTER packages/labels/coupons have been printed. There are a variety of software programs and websites which provide digital barcodes in every available graphic format, and users are left clueless as to which format is right for their needs. 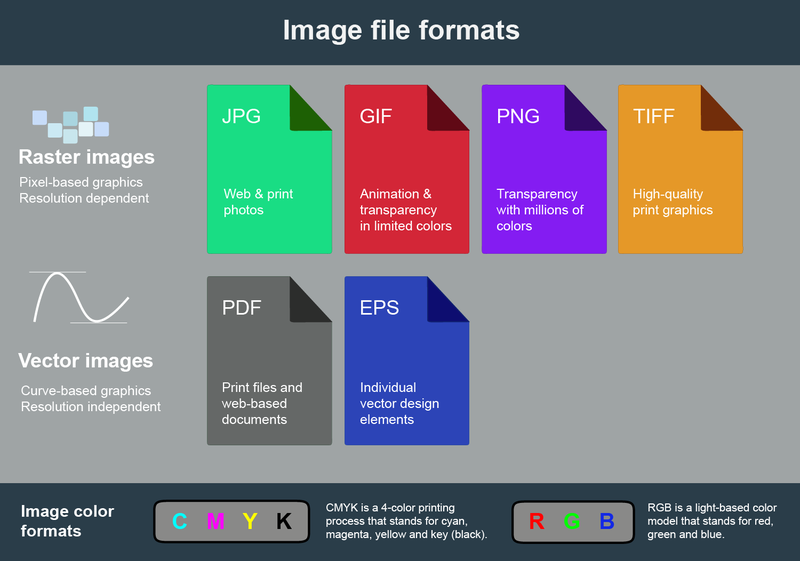 The explanation below describes each of the popular image file formats and their appropriate applications. One of the most important acronyms in barcode imaging is DPI. DPI stands for “dots per inch” and is a unit of measure for the resolution of a file, which is essential for calculating if the density of pixels in an image is proper for the application you are using. The primary factor in determining the appropriate DPI is if you are using an image for print or web display. Websites normally display images at 72 dpi, and this is typically categorized as low resolution. Images at this resolution look very crisp on a display but blurry when printed. For printable barcode images, common printing techniques such as offset, flexographic and silk screen require much higher resolution files – some with minimums of 2540 dpi. A crucial component of precise digital barcode artwork is “bar width adjustment” (BWA), which compensates for gain/reduction occurring in the printing processes. This fine tune adjustment is only possible with a high-resolution image. A barcode image file which does not account for BWA will not print accurately for most print technologies. By design, low resolution files are unable to incorporate this compensation factor. Most image files fit into one of two general categories—raster files and vector files—and each category has its own specific uses. Raster images are typically used for photographs and web graphics (such as banner ads, pictures, and ). These images are constructed by a series of pixels, or individual blocks, to form an image. Pixels have a defined proportion based on their resolution (high or low). True to their web-centric use, many are optimized to look good only at the size they were designed for so they use as little memory and bandwidth as possible. When you resize a raster image, you stretch the pixels themselves, which can result in a “pixelated” or blurry image. Raster images can be saved in one of two primary color modes: CMYK and RGB. CMYK is a four-color printing process that stands for cyan, magenta, yellow and key (black). These colors represent the four inks that will combine during the printing process. Files saved in this format will be optimized for physical printing. RGB is a light-based color model that stands for red, green and blue. These are the three primary colors of light that combine to produce other colors. Files saved in this format will be optimized for the web, mobile phones, and video—anything that displays on a screen. Vector images are far more flexible since they are constructed using proportional formulas rather than pixels. Unlike raster images, vector images are resolution independent. When you shrink or enlarge a vector image, your shapes get larger, but you won’t lose any detail or get any pixelation. All digital barcode artwork should be created as a vector image. A TIF is a large raster file and is best for any bitmap images that you intend to edit. Essentially every pixel can be bitmapped for a particular resolution. Consequently, TIF files can be high resolution but will be larger file sizes. TIF images are ideal when saving photographs for print and/or editing. They tend not to be used on the web or for print applications due to their very large size. GIF is a lossless raster format that stands for Graphics Interchange Format. GIF images are formed from up to 256 colors in the RGB colorspace. Due to the limited number of colors, the file size is drastically reduced. This is a common file type for web projects where an image needs to load very quickly, as opposed to one that needs to retain a higher level of quality. GIF file formats should never be used for barcode print applications. JPEG images are currently the most used file format for online photographs and supports a full spectrum of color. JPEG files are raster images and are known for their “lossy” compression; means the quality of the image decreases as the file size decreases. Due to the low resolution and file size, JPEG files are not suitable for printing barcode images. PNG is a bitmapped (raster) image file which is optimized for screen display. It was developed as an alternative to GIF and supports transparency in web browsers. The PNG file format only supports RGB color mode and this is problematic if you print on offset or anything that requires CMYK color mode. Similar to TIFF images, high resolution images can only be achieved from very large sized PNG files. PNG files should not be used for any type of print production involving barcodes. EPS is a file in vector format that has been designed to produce high-resolution graphics exclusively for print. 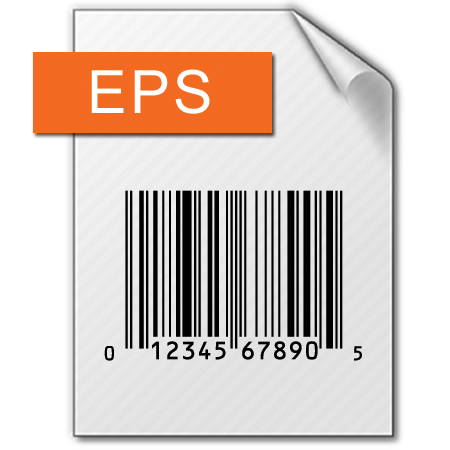 EPS files essentially contain a series of instructions for how a printer should reproduce an image at the maximum resolution. These files are the print industry standard format and can be imported or inserted with most graphic applications. 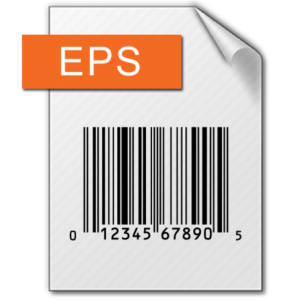 Although they are the best format for barcode images to be printed, EPS files cannot be used for web graphics. While a PDF is not really an image format, it is a file format to present and share documents independent of hardware or software. Digital barcode graphic files are commonly saved in a PDF format for proofing purposes rather than print production. Although both TIFF and EPS can yield CMYK images with the necessary high resolution required for digital barcode artwork, only EPS formatted image files can maximize the resolution of the output device and have a relatively low file size. In order for a TIFF image to be a high enough resolution, the image size would exceed 2 megabytes. Lastly, not all barcode imaging software is created equal. In 1997, the Uniform Code Council (now GS1 US) published “UCC Guidelines for Providers of EAN/UPC Symbol Design Software”. The guideline defined all of the relevant components required to create compliant high quality barcode images. The vast majority of available software and online barcode generators do not comply with mechanics detailed by this guideline. The barcode engine (PrecisionCode) which powers www.createbarcodes.com is entirely based on the original guideline. Digital barcode files from PrecisionCode can be ordered directly through www.createbarcodes.com or from our web services solutions. Who’s Controlling Your Online Product Content?